120 volt ballast, 60Hz, used to run one (1) fluorescent lamp 12 to 24 inches in length, 8 to 22 watts. Can be used in most pinball and video games that use 1 fluorescent lamp. Replaces Stern #s 010-5015-00, 010-5015-01, 010-5015-02, Bally # E-409-1, and similar others. Measures approximately 3 inches in length, 2 inches wide, 2 inches tall. If your fluorescent lamp does not light up, or if your game keeps burning up lamps and starters, you may need a new ballast! NOTE FOR EXPORT GAMES USING 220+ VOLT POWER: Stern Pinball games are specially-wired at the factory to allow use of this ballast in locations that use 220+ volts at the wall outlet. This ballast will work in your game if your ballast is not connected directly to 220+ volt line voltage. 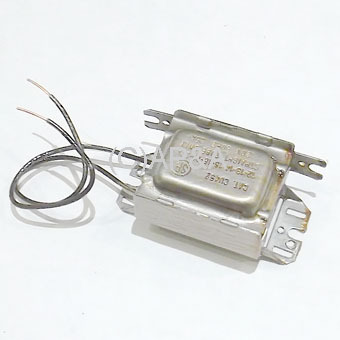 That is, if your old/existing ballast is supplied ~120 volts AC from the secondary side of its transformer, then you can use this ballast, even if your game is connected to 220+ volts at the wall outlet. If you have a game running on 220+ volt power, before ordering, please carefully check voltage on supply wires for the ballast in your game with power on, to confirm operating voltage, or check your old ballast casing/exterior for stamped voltage values.